Michael R. Grasso, known to all as “Mickey”, joined Acacia Investigations in 2005. He is a certified Connecticut Fire Marshal and Fire Investigator and has served as a police officer, firefighter, and fire inspector. Mickey currently serves as a Fire Marshal in a Western Connecticut community. 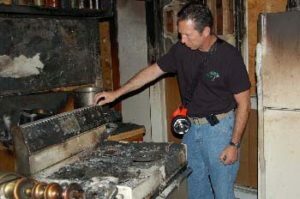 He has over twenty five years experience in fire investigation. Mr. Grasso has specialized training in fire and explosion investigation having attended courses at the F.B.I. Academy in Quantico, Virginia; Bureau of Alcohol, Tobacco and Firearms National Training Academy at Glynco, Georgia; National Fire Academy in Emmitsberg, Maryland; U.S. Department of Justice and F.B.I. Bomb and Terrorist Schools in New Mexico, as well as the Connecticut State Fire School and State Fire Marshal’s Precertification School. Mickey has also attended Western Connecticut State University taking law enforcement courses. Additionally, he has extensive training in fire suppression, fire code, emergency medicine and hazardous materials. Mickey has memberships and affiliations with numerous professional organizations including the Connecticut Fire Marshal’s Association, New England Fire Marshal’s Association, Fairfield County Fire Marshal’s Association, Connecticut Chapter International Association of Arson Investigators, International Association of Bomb Technicians and Investigators and National Association of Fire Investigators. In addition to being certified by the Connecticut Department of Public Safety as a Fire Investigator and Fire Marshal, he is licensed as a Private Investigator by the State of Connecticut. Interestingly, Mr. Grasso has worked in the past for a fuel oil company, as a carpenter, as a patient care technician and as a funeral home assistant. He is an extremely competent interviewer and fact gatherer. Mr. Grasso is a detail-oriented and thorough investigator, who has testified as an origin and cause expert witness in court and at depositions. He is highly regarded by his peers in law enforcement and the fire service. We are pleased to have him on our team.